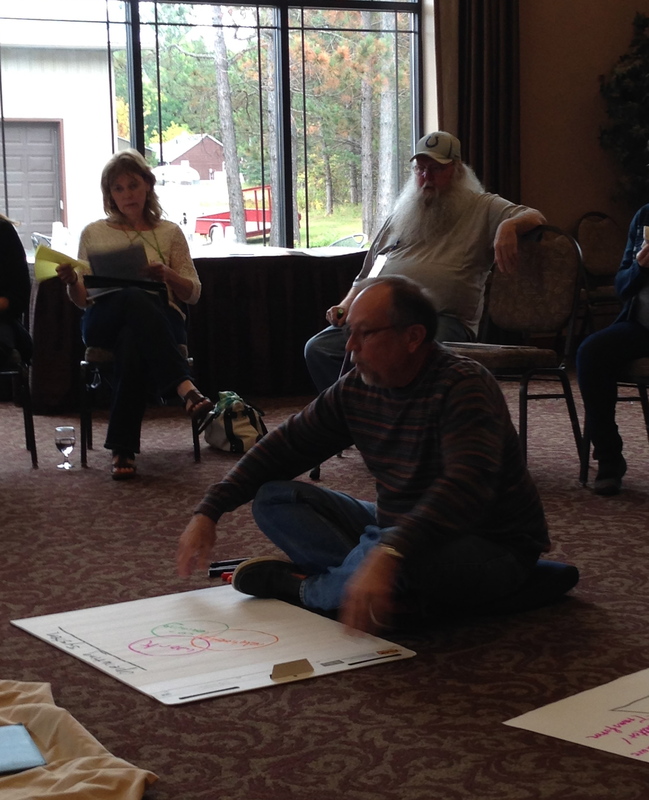 In Grand Rapids, MN, since November 2013, over 150 people have experienced an Art of Hosting training. It is a community of real people, real lives and real impact. Jerry Nagel and I have begun to document some of the success stories – many of them small miracles that provide inspiration to us and so many others who might be wondering where you start once you have been to an AoH training. This account was provided by Audrey Moen who attended the training in September 2014. Audrey Moen in the circle with others taking in a teach by Jerry Nagel. When I first signed up for the AoH training some people asked me, “Oh, why would you want to do that? It is just facilitating. You already know how to facilitate. Why go for three days?” I knew, just in the title, before I even read the details of what AoH is, it was indeed going to be much more. I was able to bring a diverse group of people with me who normally never attend training like this. They are considered on the outside as poor, disabled, or have histories that do not allow them to secure basic housing. They may have had a criminal background. They may no longer have the right to vote. It did not matter. They were welcomed as if they were Kings or Queens. What they took away from it has increased their lives. One is on his way to attend the Day on the Hill at the Capital; one is now leading a group locally; one stated that she feels a sense of confidence and acceptance she never had before. The learning that took place is something that will, for me, be life-long. I use it every day in the little things. I think about table conversations in a different light. I encounter situations that in the past may have been met with roadblocks. With the AoH and Worldview skills this does not happen. If anything, I find that the skills learned open doors to communication; barriers or walls fall down, and people open up – trust is alive in the room. The three days went by in a blink. I met people I never knew, developed stronger community links, shared values, insight and ideas that were priceless. I also was able to participate in the Grand Gathering in Grand Rapids, MN. What a day of positive energy and inspiration! I also participated in the Theory U advanced training day which has already helped me in my career, my volunteer work, and in my home life. 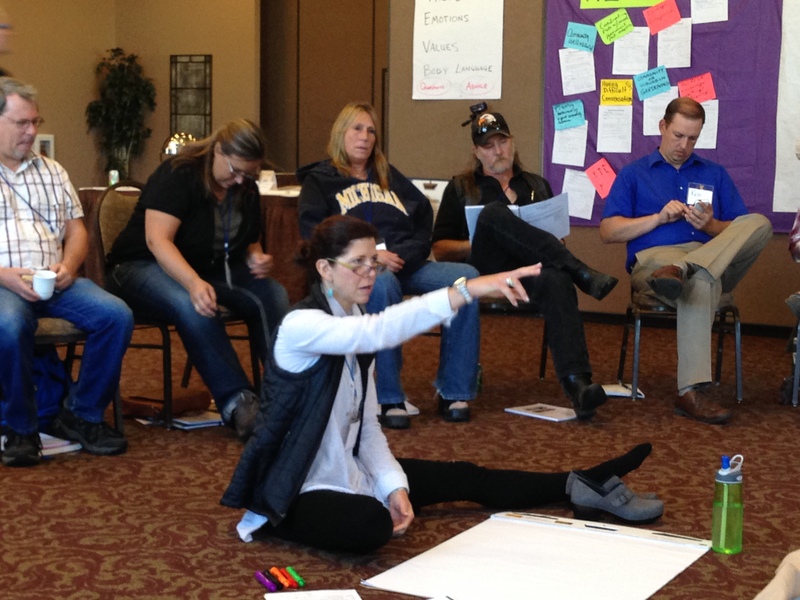 The facilitators for AoH are well trained in their field, they are engaging, accepting, and are an inspiration. My thanks to the Blandin Foundation for providing this training. I would like to see it continue. The community needs to keep the momentum growing so the seeds can continue to take root and grow. The Foundation is very good at keeping things rooted as long as needed. I met other AoH participants who attended the training in our area and in other areas. They consistently state the same thing; AoH is a process; it is not a day, an hour, a moment. It is about taking the time, always learning, developing, reaching out, community building, and engagement. Thanks again for offering the AoH to our area. I can honestly state I hope it can continue. There is so much to learn and put into practice! This entry was posted in 3 - Host conversations - contribute, Art of Hosting, Art of Hosting Works, Community, Engagement, Stories, Worldview and tagged #aohworks, Art of Hosting, Blandin Foundation, collaborative leadership, Community, community of practice, Grand Rapids, impact, open doors, removing barriers, trust by Kathy Jourdain. Bookmark the permalink. Your article reminded me of one I wrote myself about the impact of a AoH training I participated in in 2008, living the process in the meeting. Read it at http://tufftimesbutnotforyou.blogspot.be/2008/10/my-3-day-learning-through-art-of.html . Great post Michel and very aligned with so many AoH experiences.